You’ve heard it because it’s true. And it resonates with students who have experienced just what this card does for you. To put it simply: it works. Over the years, hundreds of thousands of students have used the Panamaniac Club Card to save a lot of money and make their Spring Break a truly memorable experience. Free access to daytime and nightly parties each and every day at a different club! Isn’t that what you want? Purchase All Event Tickets Right Here! There’s also special discounts at popular local restaurants and stores, a free souvenir t-shirt, and of course, complimentary beverages. How could you say no to this?! There are only so many cards we can sell. Secure your card right now and pre-order yours online today at www.panamaniacclubcard.com before time runs out. Pre-purchasing your card online allows you to have peace of mind, knowing that you will be guaranteed to have the most in-demand club card of Spring Break. This card will sell out each and every week, so be sure to get yours now! Get the card and you’ll save over $300 during Spring Break. It’s that simple. And it works! Spring Break Holiday Sale is On Now! 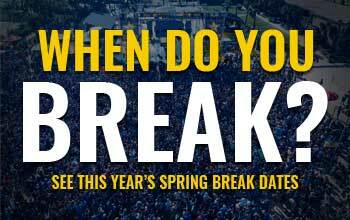 Win A Free Spring Break Vacation See The Spring Break Release Dates Get Social Click Below!